This has been a week for us to stay close to home. Christmas was not an easy time for Amber and her body was worn out. She had no more go. As the saying goes for people with chronic illnesses, she was out of spoons. Amber has been sleeping roughly 14 hours a day to help her body recover. It's been rough, but we saw improvement Thursday. Sleeping that much does make for some fairly short days though and she has so much playing she wants to do. Even though we were off of school and still will be for a while, Amber has learned a few things this past week. 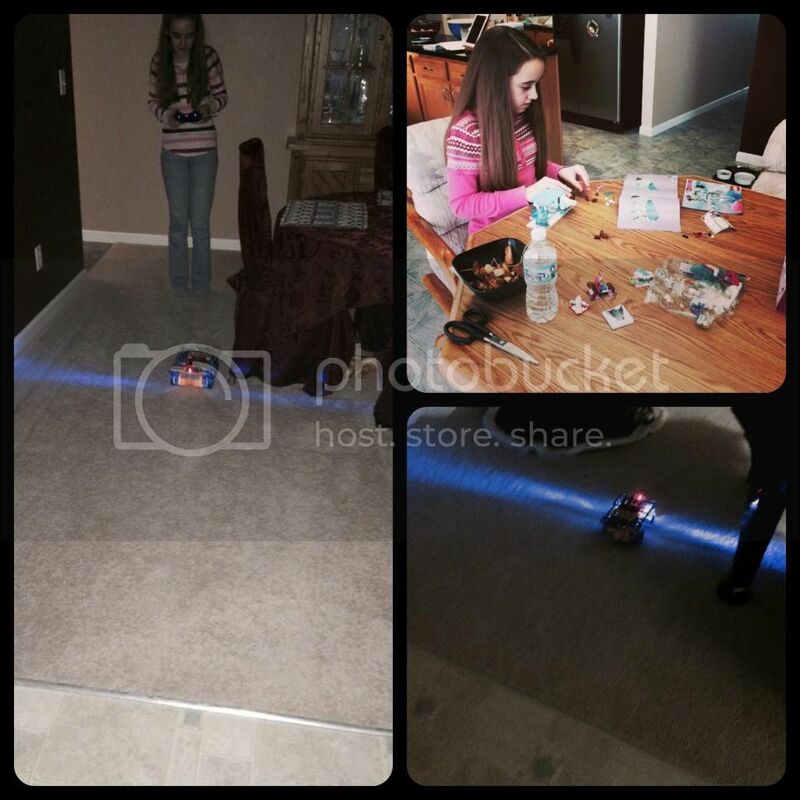 On a whim, I purchased the Snap Circuits Rover as a Christmas present for Amber. She has other both small and large Snap Circuit kits that she enjoys yet isn't gung-ho about, which made the response to the rover a complete surprise. She was overjoyed when opening it, couldn't wait to build it, and has been driving the noisy thing around our house for days. It also terrifies the cats, except the one (Biscotti) that has figured it out. Monday since Fred was on vacation for another day I braved the grocery store with Amber and Fred. Lately the grocery store has been too much walking for Amber especially as they don't have places to rest and the kid carts are not the kind she can use, unlike Target where she fits in the double kid cart because it's just a big plastic seat at the back of the cart. So, on Monday Fred went with us to the grocery store so he could oversee Amber's first use of a motorized shopping cart. There was no way that I would be patient enough to shop and oversee that use and Amber never has enough energy to just run out to test drive a cart. Amber did a good job learning all the controls, but that was the easy part. The hard part was teaching the almost-13-year-old rules of the road aisles. She has trouble at intersections and drives just like she walks: zoned out. There were times she nearly plowed me or other shoppers down because she just forgot she was driving. Fred was forever reminding her. Sigh. By the end of the shopping trip we were a little more confident, but this is going to require a lot of reminding on my part too. I'm still not going to be able to make large grocery trips with Amber as the motorized cart doesn't hold a lot and I can't manage her and a grocery cart too. Still, for the few things that we can't get at Target, this will work. I'll just have to be a weekend shopper for larger trips so that Fred can keep Amber home. Today Amber woke up with a stomach ache / nausea. She described it as "hurts like other people's stomachs, not like mine." We assume this means she's sick in a conventional manner. No fever that we can detect, but her body doesn't regulate it's temperature properly so her body temp is usually all over the place. Today at Noon it is 97.3 degrees Fahrenheit. Earlier it was 98.9 degrees. The thermometer is working; I used it on myself and was a consistent normal temperature. It's going to be a stay-in-bed, pajama wearing, video gaming playing type of day for Amber. Unfortunately, she was having so much fun the past two days playing the new PS4 and her new Disney Infinity 2.0 which is attached to a television. There are no TVs in Amber's room and she isn't feeling up to going to a room with a TV. Maybe later in the day. (Left-top) Driving the grocery motorized cart. It was not a particularly good day, but she made a go of it. 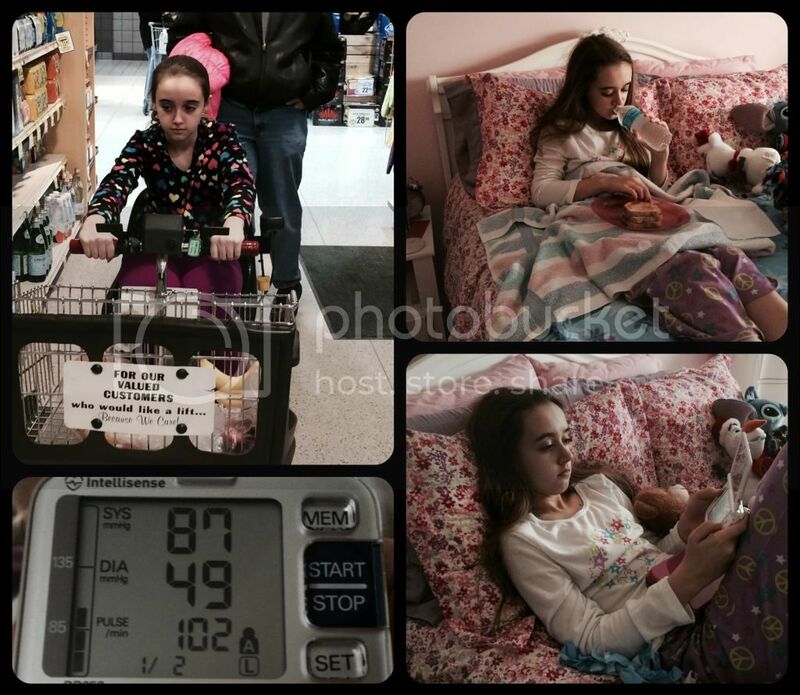 (Left-bottom) Her morning vitals, prior to getting out of bed. Sigh. (Right) Sick day because she might actually be sick from a virus and not just an autoimmune disease today. Even before today's bout with illness, I had decided to hold off our official start of second semester until after Amber's birthday in 10 days. She is still worn out from December and she can't recover if we are trying to have full school days. I also don't anticipate full school days until the end of January; at least that's my goal. We'll start after her birthday with a couple of subjects per day and rotate the subjects. However, until mid-January we will be relaxing, playing some logic games to keep our brains going, and generally trying to recover. Until recently I would not have had the courage to delay school in this manner. I'd have pushed Amber too early and who knows what the results of that would be. It takes time, but you learn eventually that it really is alright to do what is needed for your family in regards to schooling. I guess it took a while to deprogram me as a public school child and private school parent. We have no weekend plans as a family, but I've got a few things on my to-do list. Amber's medical visits start back up on Monday, but this year we have new insurance cards with all new numbers. Same plan through Fred's work, but for some reason known only to the provider every last number on everyone's cards changed. That's going make this year fun. I think you are wise to make the choice to wait on starting up school. I hope the stomach bug goes by quickly. I was looking at the snap rover. I think I will add it to my wish list. My kids love snap circuits. I always enjoy catching up with you. I'm glad Amber was able to enjoy her Snap Circuits kit. It does look like a lot of fun. I must be behind the times. I didn't realize they have such cool kits. I've probably said this before but there sure is no denying it when Amber has over exerted herself. She wears her exhaustion on her face! Feel better Amber and good luck on your driving lessons! She does wear that exhaustion quite visibly. Many people comment on it. At least it's not like she's pretending to be tired. Christy, you do such an amazing job balancing out activities with rest and making sure Amber gets want she needs as well as lots of what she wants. I'm sure this year will be hugely successful, academically speaking, even though you both have so many hurdles in your path. I do hope you both have a wonderful 2015!